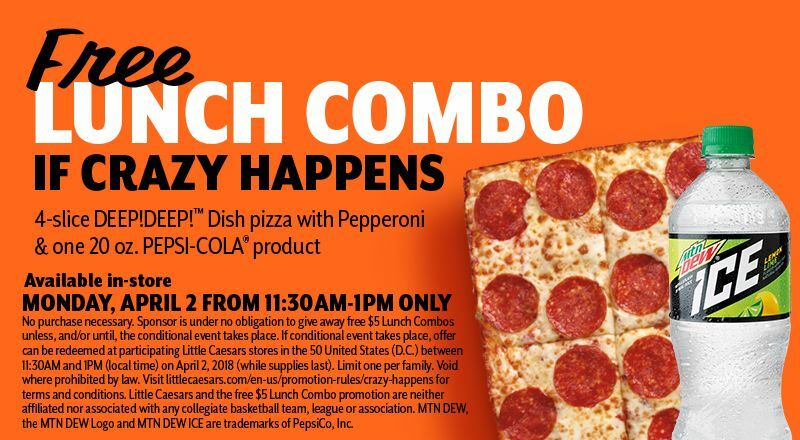 Little Caesars lost a March Madness bet, so now you get a free lunch! The restaurant said it would give out free lunch boxes if a No. 16 seed beat a No. 1 seed in the NCAA Tournament. Well, it happened on March 16 for the first time ever -- the University of Maryland, Baltimore County, defeated the Virginia Cavaliers 74-54. Little Caesars will give out $5 Hot-N-Ready pizza combos at no cost Monday, April 2 from 11:30 a.m. to 1 p.m., while supplies last. They include a deep dish pepperoni pizza and a 20-ounce Pepsi product.